Since 1994, hundreds of satisfied Califon community members have trusted Pete and his team of ASE and ATI Certified professionals for outstanding repair and maintenance. Freeman Motors offers complete auto, truck, trailer and RV service and is a New Jersey licensed inspection center and certified emission repair facility. 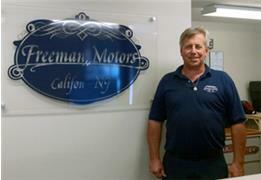 Freeman Motors is well known in the area for horse trailer repair and RV diagnostics and repair. We also have a diesel specialist on staff! Call us at (908) 832-0076 to schedule an appointment or just stop on by.